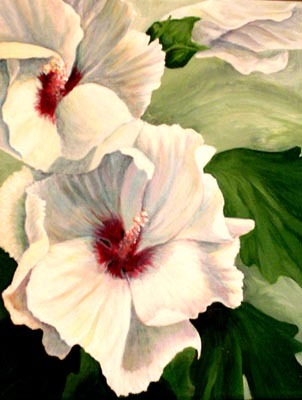 Rose of Sharon is the oldest of the Joad daughters, high-spirited, impratical, and pregnant. She is the stereotype of a young, saucy girl transformed into a secretive woman, blushing with pride because of the new life inside her. "She was all secrets now she was pregnant, secrets and little silences that seemed to have meanings" (Steinbeck 175). Her husband is Connie, a young man of nineteen, "proud and fearful of Rose of Sharon. [He] had married a plump, passionate hoyden, [and] was frightened and bewildered at the change in her...There was a balanced, careful, wise creature who smiled shyly but firmly at him" (130). Together, they live in constant affection and pleasure, dreaming of the life they will make for themselves when they reach the promised land of California. This dreams are destroyed, however, by the brutality of traveling. Connie abandons the Joad family and leaves his wife desolate, and Rose delivers a stillborn child "a blue shrivled little mummy" (603). She is childless and hopeless, as the family reaches its most desperate point. Taking shelter from an unceasing rain, the Joads come across a young boy and his starving father in a barn, Rose immediately finds a purpose in her life and gave her milk to the man. "She looked up and across the barn, and her lips came together and smiled mysteriously" (619). The Grapes of Wrath by John Steinbeck follows the Joad family as they experience the triumphs and hardships of life on the road, and encounter the best and worst of the human spirit. The dustbowl of the 1930s left their Oklahoma farm desolate, and the banks had forced farmers off of their land and onto Route 66 to the Promised Land of California. Product of West Morris Central High School: Meaghan C. Sara M. Katie P.